The impact of climate change is on the rise and no part of the world is immune. South Asia, home to some of the world’s poorest and hungriest peoples, emerges as especially vulnerable. A new study by the World Bank projects a steep decline in living standards in Bangladesh, India, Pakistan and Sri Lanka because of changes in average weather conditions and rainfall patterns. The impact of climate change in some of these regions is expected to be amplified by developmental challenges such as low consumption, poor road connectivity, and limited access to markets. Floods, storms, droughts and wildfires may be some of the natural calamities that are now imminent in South Asia’s future. Warmer ocean temperatures and melting polar icecaps have triggered a rise in sea-levels, putting many regions at risk of extreme flood-related damage. Equally alarming is the change in rainfall patterns, which has led some areas to become devoid of water altogether. These regions have been identified as “hotspots”. The agricultural sector, which employs about 50 per cent of the workforce in countries like India, has been hit the hardest. The rise in sea-levels has jeopardized the availability of fertile land while an increase in temperatures is reducing the ability of farmers to work outdoors for extended lengths of time. Since many in this region are dependent on subsistence farming that requires grueling outdoor labour, climate change poses a massive threat to their livelihood and equally to regional food security. Almost half of South Asia’s population now live in areas that are projected to become moderate or severe hotspots in the next few decades. The World Bank study contemplates the fate of these vulnerable regions in two possible scenarios. One is a “climate sensitive scenario” where concerted global effort to mitigate greenhouse gas emission may limit temperature rise to below 2 degree Celsius. As many as 195 nations have already pledged to this goal in the 2015 Paris Agreement. If these countries stick to their commitments, many of these regions may be prevented from becoming hotspots, reducing the impact of climate change significantly. The other is the “carbon-intensive scenario” where the trajectory of ‘doing nothing’ continues. In this case “wet-bulb temperatures”- a composite temperature that combines heat, humidity and the ability of the human body to cool down naturally – will exceed the “survivability threshold” by the end of the century. If this happens even the fittest humans will die after six hours of sun exposure. Some areas in South Asia are already facing the repercussions of this business-as-usual approach. In 2015, a heat wave struck Andhra Pradesh, in Southern India, claiming some 1,735 lives. The wet-bulb temperatures were recorded to be higher than ever, around 50 degrees Celsius. Unchecked emissions will have uneven impact all across the globe. 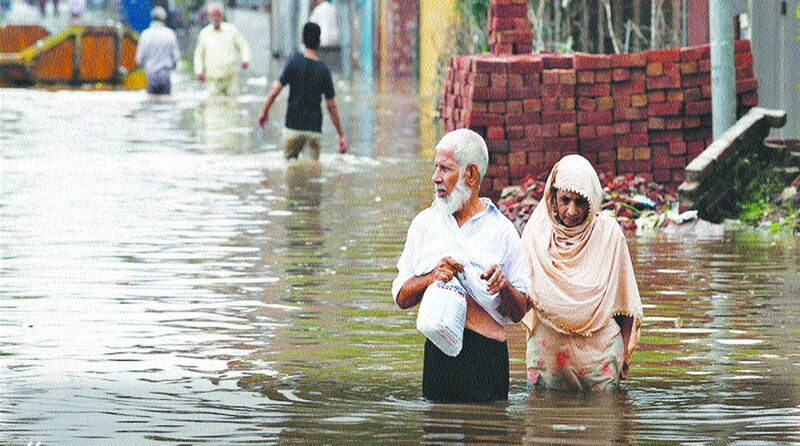 Some cities like Karachi, Dhaka and Kolkata face a substantial risk of flood-related damage. Areas in northern Pakistan and eastern Nepal may experience increase in annual average temperatures of about 1 to 1.5 degree Celsius. By contrast, living standards in colder regions may improve marginally. The severity of outcomes differs depending on our current emissions, and our effort to reduce future emissions. Soon, preventing drastic climate change through simpler methods like rainwater harvesting or using solar energy may not alleviate the distress many populations are facing. Thus, building resilience to climate change should be a top priority for most nations. By establishing the relationship between household characteristics and declining living standards due to climate change, the study recommends interventions to build resilience. However, no single set of interventions will work for all regions. Given the varying topography and climatic conditions of all these vulnerable regions, interventions will have to be tailored to the specific regions. India and Pakistan will be forced to increase opportunities in the non-agricultural sector. Urban regions in these countries will have to increase infrastructure, reduce water stress and prepare for a population surge due to displacement of farmers and other rural people due to loss of livelihood. Continued greenhouse gas emissions threaten the lives of approximately 800 million people. If urgent action is taken and carbon emissions plummet, this number may fall to about 375 million. With some nations threatening to pull out of the Paris Agreement and others falling short on their commitments, the fate of these regions hangs in the balance. If emissions continue at this rate, the future of these 800 million will be bleak indeed. The writers are respectively a final year student and a professor of law at Jindal Global Law School in Sonipat, Haryana.